What you desire shall come to pass because what is before you, ready and waiting to harvest, was initiated from the echoes of your intentions strewn across the sky of your dreams. Your “open heart” has brought forth the richness of life, which now opens its heart to you so that you may walk boldly to it and participate fully in it. This Solar Eclipse New Moon has something very interesting to say: leave your past behind you, be curious about your potential, and let that open some beautiful doors. Through a kind of forgetfulness, we truly can leave the old story of our lives behind us. This begs the question of the usefulness of therapy as often we can get mired in endless loops of why things happened a certain way. We tell the same experiences over and over to whoever will listen and give us attention. We attach ourselves to the pain and identify with a story of struggle and suffering, that we become convinced that either the world is against us, that life is supposed to be this way, and that people owe us something. It can become very easy to get lost in a psychological world based on our emotional distress, projecting onto others and then not understanding our reactions to people, and other people’s reactions to us. Going into our past can be useful when emotional blockages prevent us from progressing and realizing our positive potential. Working with an experienced guide can be invaluable in pointing out the projected thought, asking why we think something is so, and then isolating and bringing out the stored emotional resistance. Sometimes the memory is locked so deep and covered in layers of intellectual reasoning, that releasing it often brings a wave of emotion. I bring up these points because it’s important to be conscious of our journey. To sort out what needs to be released, to take ownership of how our beliefs have shaped us for better or for worse, and to reach for an elevated state of being so that we can allow a fundamental shift to occur. This happens when we begin to narrate a story that focuses on our personal thriving. Eclipses bring forth these types of critical shifts. They break things down, stir things up, move energy around, and attempt to reconnect us to our source and our light. The more we can view any change that occurs in our life as a positive shift toward personal alignment, the more we can feel that this energy is moving through us and not at us. This is a key message in this months reading. Two major arcana cards, The Fool and The Empress are linked here by the glow of the Sun shining its golden rays in both cards; they are one environment. They are the upper frequency of “change that is resisted”. Meaning, they indicate that our consciousness is dwelling in positive, proactive and potential-driven language. The Fool is at the beginning of his or her journey, carefree and trusting in life to take care of things. Almost to the point of naivety, it is the essence of positive expectation. However, its connection to The Empress suggests clearly that we’ve been waiting for this moment for a while. We didn’t just wake up one morning and decide to walk off a cliff, nor did we meticulously plan every detail of this new chapter of our life. It is only in our youthful curiosity and surrender that has allowed this opening to take place. The Fool’s garment also seems to come out of the background forest of the Empress’s realm. He seems to emerge from her wilderness garden, carrying forth its essence. 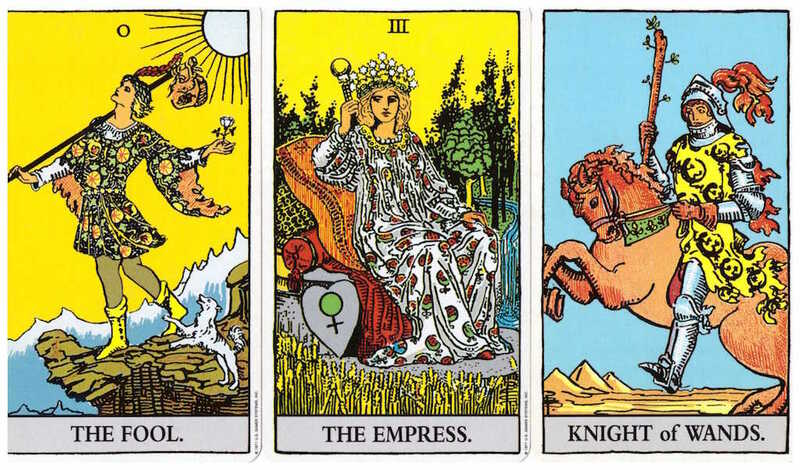 But since The Empress card represents the here and now, it suggests that we are coming back to something under her domain that is more embodied and manifest. The Empress to me suggests a rendezvous with something we had planted some time ago: a desire, intention, emotion or passion. What is significant is how those things have developed. As in Nature, something unseen takes over. A life force takes hold, nourishes and fertilizes them. We experience Nature through our feelings and our senses. We are less concerned with logic and structure, and more relaxed in our ability to connect with the pervading abundance. It is as if we are walking in a landscape that once existed only in our dreams. The old stories have very little bearing over us now. They are very much like murmuring creeks and the wind in leaves, placed in the background and decidedly unimportant to us. We are defined by a habitual propensity to exist exclusively in a harmonious mindset. The Knight of Wands holds two key visual connectors to The Fool, which gives us it’s meaning. The first is that the carefree and energetically dormant pouch stick that the Fool is carrying has been transformed into intentional power that the Knight is holding firmly. The second is the stance of the loyal dog following the Fool and of the loyal horse and vehicle of power that the Knight now rides upon and controls. The Knight’s cloak is also the yellow of the sunlit skies in the previous two cards, with the added emblems of lizards that have not bitten their tales to form a closed circle. The resulting opening is a symbol of the beginning of things, rather than the finishing of them. This further emphasises a message of maturity, integration, and of conscious awareness of one’s purpose. What has influenced this maturation and integration? The Empress. This process is directly linked to her. It is linked to the power of Venus (shown as an astrological symbol on the heart shield resting on her throne) the goddess of love, beauty, feminine power in its outward manifestations, and the flow of energy that connects us to the flow and abundance of the earth. The Knight of Wands is the acknowledgment of one’s power and the respect and reverence of its energy. When this power has transformed us, we effectively are launched into a new chapter. Our foundation is not reckless, it is burning with renewal. Our appreciation of the Sun on our backs is deeper now and more tangible, more engaged in the world. The Fool reaches out and offers a rose to The Empress; The Knight salutes her with his gaze and his horse bows his head. We have given ourselves a gift here too: to experience freedom. How did we do this? I hope more people would read this as it cannot but touch all with joy; wonderful, thank you Daniel! Thank you Sophia, I’m very touched by your comment!